Husky feeding is not complicated if you keep a few things in mind. In general, Huskies require less food per pound of body weight than other breeds of the same size. The diet should be high in protein and fat, and low in carbohydrates. If you have an actively working Husky, his diet will require a performance formula food. A maintenance formula will be fine for non-working Huskies. Ultimately, the most important aspect of Husky feeding is probably what food you feed them. When it comes to feeding your Husky, you will definitely want to select a high quality food in order to avoid the potential health problems that can result from a poor, low quality diet. Read the labels on all the foods that you buy your Husky. The first ingredient should be some type of meat, not a meat by-product. If the first few ingredients contain corn, wheat, meat by-product or bone meal, it usually signifies a low quality food which contains filler ingredients and should be avoided. Meat by-products are the leftovers from animals (hooves, skin, feathers, feet) that are not fit for human consumption and should not be fed to your Husky either! Corn is a filler ingredient that is not digested at all in dogs, and causes them to produce more waste. Foods that contain filler ingredients also mean that more of the food needs to be fed in order for your Husky to obtain the proper nutrients from it. Be aware that the first ingredient may not be a true representative of what is most abundant in the food. For example, if the first ingredient is listed as “chicken,” it is only taking into account the weight of the chicken before it is cooked or processed, including the water content. Since the meat contains about 80% water content, after processing, there is only about 20% of actual meat in the dry food. Therefore, if the second ingredient of the food is just a filler ingredient such as corn, it would mean that there may be more corn than chicken in the food. Feeding your Husky a good quality, grain-free diet is beneficial in the long run. Although the costs of the food will be higher, it can save you from potentially spending hundreds to thousands on vet bills in the future. 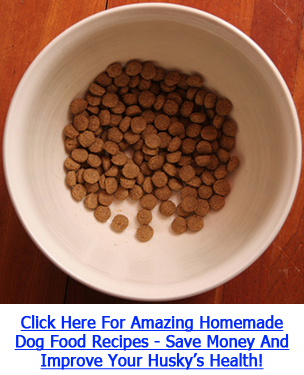 Click Here To Discover How You Can Save Money AND Improve Your Husky’s Health With Homemade Dog Food! It is necessary to create a feeding schedule for your Husky, since they may overeat if free fed. A young puppy (8-12 weeks of age) should be fed three meals a day. At 3-4 months of age, cut back to 2 meals per day. Only one feeding a day is required at 7-9 months of age and onwards. Stick to feeding your Husky the same amount at the same time everyday. Avoid overfeeding your puppy, as that will cause diarrhea. Also avoid feeding table scraps, as this will throw off the balance of your Husky’s diet and nutritional requirements. You should only switch foods when really necessary – for example, if you are switching from a puppy food to an adult food, if your dog is allergic to his current food or if your vet recommends a switch. It is still highly debated whether switching foods for the purpose of adding variety is beneficial. Some claim that switching to a different food every 3 months reduces the risk of food allergies developing. You should also discuss with a vet or experienced breeder about switching foods if you are considering doing so. 100% new food – done! If your Husky does not show any signs of digestive troubles or changes during or after the switch, you have successfully switched to the new food and can continue feeding it. If your Husky shows any symptoms of digestive issues during the switch, such as an upset stomach or diarrhea, discontinue feeding the new food and consult a vet.